On Monday 23rd July 2018, we were invited along to the wonderful First Derivatives HQ in Newry. The hardworking staff held a 'dress down' day to raise vital funds and awareness for PIPS Hope and Support. 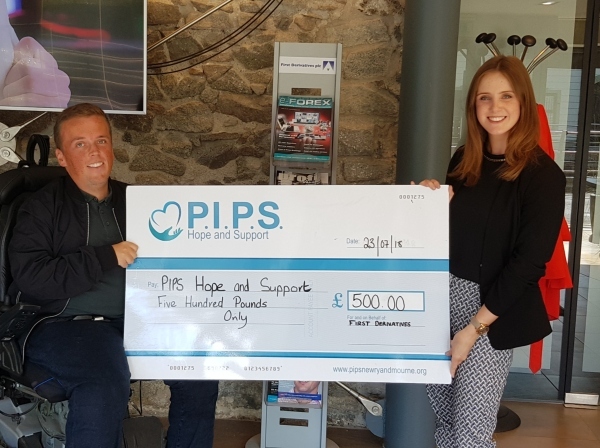 Pictured is Jenna Dutton representing First Derivatives presenting PIPS Hope and Support Fundraising Officer Padraig with a cheque for £500.00. Big thanks to every @ First Derivatives for the continued support and for choosing PIPS Hope and Support as your beneficiary. Your support will allow us to continue doing what we can.